RGV FC Toros' Memo Rodriguez (16), center, celebrates his goal against the Orange County SC in a game held at H-E-B Park Wednesday, April 25, 2018 in Edinburg. 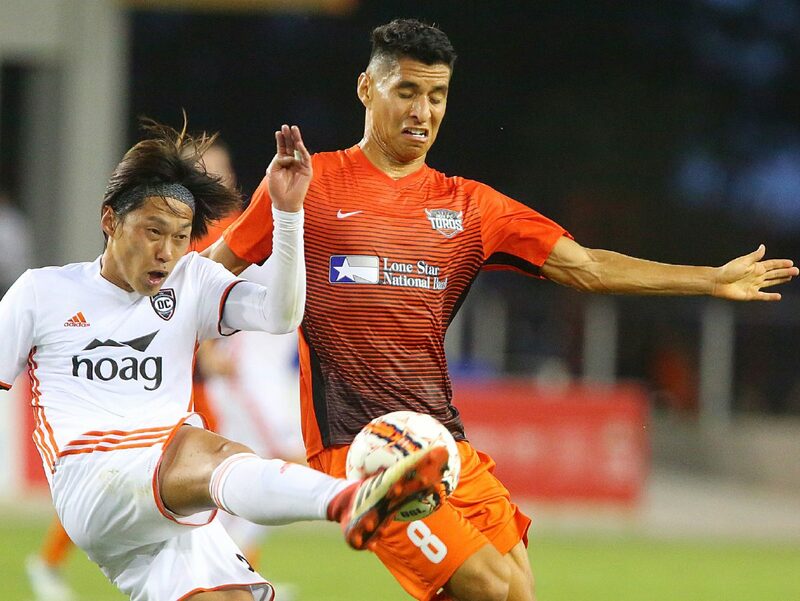 EDINBURG — Midfielder Memo Rodriguez is no stranger to the RGV FC Toros. He played all 30 games during the franchise’s inaugural season in 2016, then returned from the Houston Dynamo to make four appearances last season. Still, being down in the Valley for his first action of the year on Wednesday, Rodriguez was surrounded by unfamiliar teammates. Of the Toros’ starting 11, only midfielder Todd Wharton was a regular fixture on the 2016 or 2017 rosters. 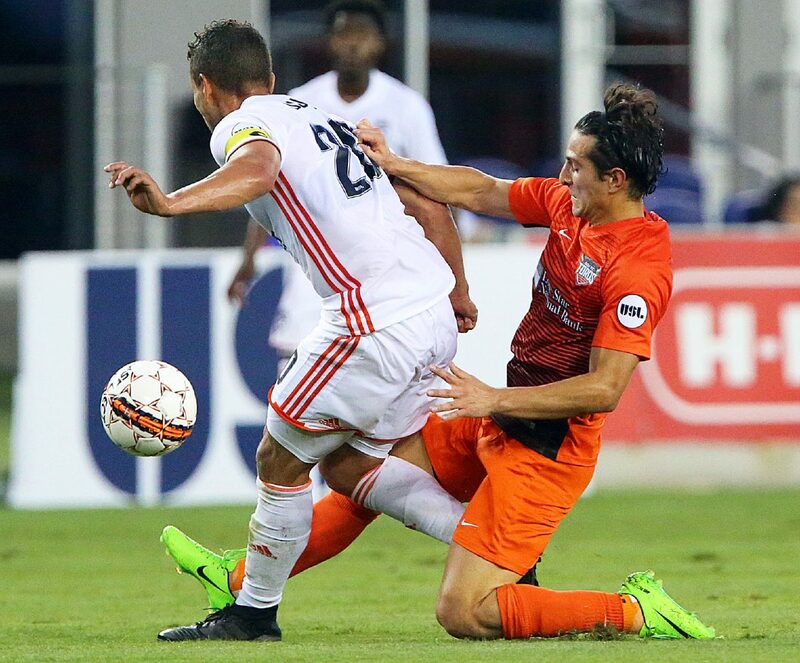 Rodriguez finished a cross from fellow Dynamo assignment player Mac Steeves in the 36th minute, propelling the latest iteration of RGV FC to its first win of the year with a 2-0 result against Orange County SC at H-E-B Park. RGV FC Toros' Memo Rodriguez (16), right, celebrates his goal against the Orange County SC in a game held at H-E-B Park Wednesday, April 25, 2018 in Edinburg. RGV FC Toros' Pablo Aguilar (10) and Orange County SC's Christian Duke (20) battle for the ball in a game held at H-E-B Park Wednesday, April 25, 2018 in Edinburg. RGV FC Toros' Nicolás Perea (8) and Orange County SC's Koji Hashimoto (22) battle for the ball in a game held at H-E-B Park Wednesday, April 25, 2018 in Edinburg. 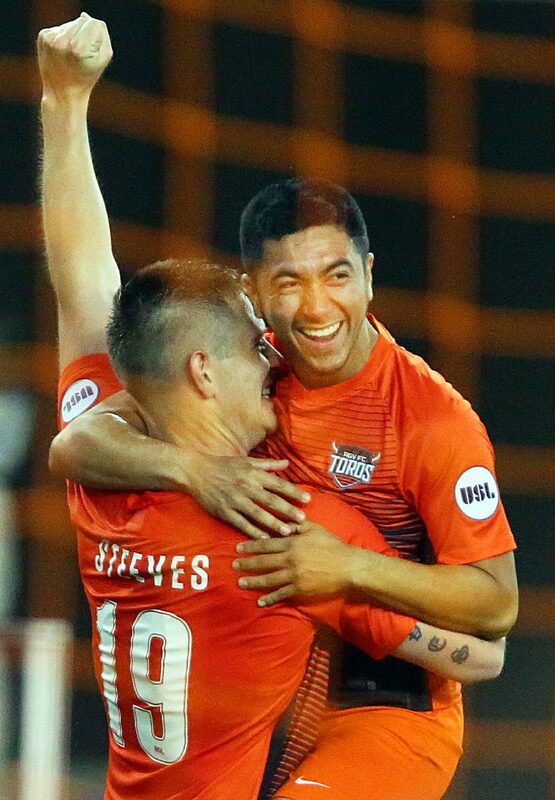 The new-look Toros had been 0-3-2 to start the 2018 season before knocking off an OC side that had won three straight matches by a combined 11-0 margin to hold the USL’s best goal differential. Steeves triggered the cross that led to the game-winning goal from the right side of the pitch. After a throw-in, Steeves evaded a double-team by putting the ball past his defender’s left shoulder and running around his right side to retrieve it. With a third defender closing from the inside, Steeves sent a driven cross into the penalty box. Rodriguez chested the ball down on a short hop and then finished it into the left side of the net with his left foot from about 6 yards away. “It was a little bit of a difficult finish, but thankfully, I made it,” Rodriguez said. Steeves, who was selected No. 43 overall by the Dynamo in the 2018 MLS Superdraft, was making his first professional start and notched his first professional point. Racking up points with the Toros is much more customary for Rodriguez. He netted three goals in just four matches with the team last season after scoring six goals with seven assists during RGV’s inaugural season in 2016. Entering Wednesday, the Toros had on four occasions let second-half leads slip away to remain winless through five matches. 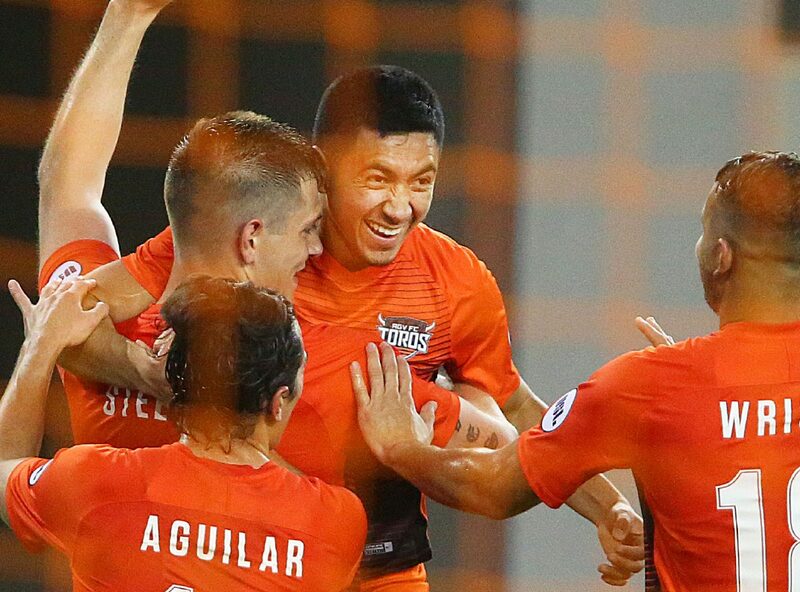 RGV struggled to maintain possession against OC, holding just 34.2 percent for the game, but the Toros put seven shots on target compared to Orange County’s two. Echeverry said the Toros were content to concede the possession advantage as long as they were able to plug holes defensively and find opportunities on the counterattack. He added that closing games has been a major theme in recent training sessions, and RGV came through in that regard Wednesday. Substitute forward Aldo Quintanilla iced the match with a goal in the 89th minute. Todd Wharton poked the ball free from a crowd of players, and Quintanilla took possession, dribbled around a defender, carried just inside the top of the penalty box and then drilled a shot into the lower-left corner of the net.